Here’s the Strawberry Season braid, mostly spun up and Navajo plied. I divided the braid into three strips. What you see here is two-thirds of the braid – two out of the three strips. I still have one more strip to spin – and since I like the result of this – 206 yards/190 m of yarn, I’ll be doing the same drill – spinning it fine, and putting a lot of twist into the ply. In this photo below, it hasn’t been washed yet. And here it is after it’s been washed, bashed, thwacked and dried and plumped up a bit. It is a lovely yarn and I can’t wait to knit with it. But for the sake of “project completion” I will finish spinning the rest of the braid first. That’s what I will do today so I can start knitting up some socks. 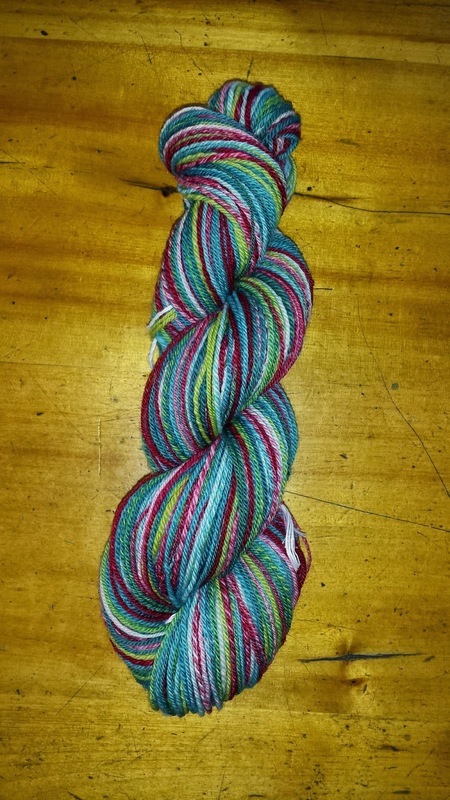 This entry was posted in fibre club, navajo plying, spinning on July 31, 2014 by DianaTwiss. 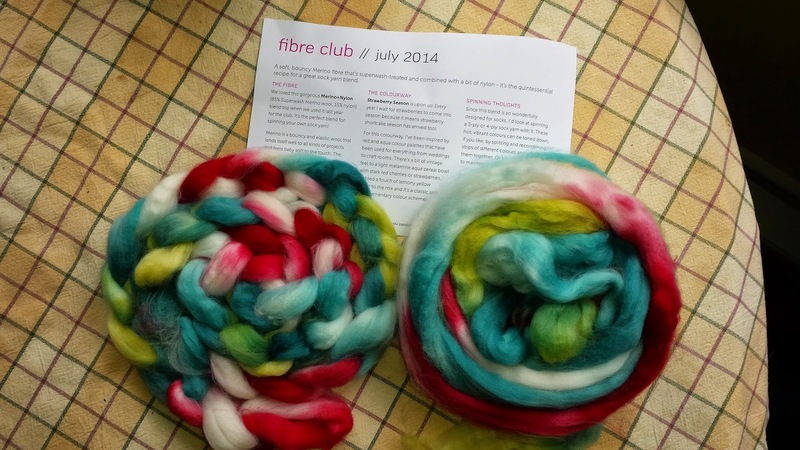 The July Fibre Club is a 4oz braid of 85% Superwash Merino wool and 15% nylon. The colours are intense and yet there is a lot of white in between the colours. For me, this is great because the red doesn’t move into the green, it has a space of white, so you get a lovely pink, then white, then light green and then the intense green. It also means that you don’t have complementary colours like red and green blending. It is an interesting result, but not for something that is to remind you of strawberry fields and freshly picked berries. I am spinning it fine on my Ashford Joy and putting a lot of twist into it. The plan is to chain ply it so I can maintain the colour stretches. The final project goal is a pair of socks. 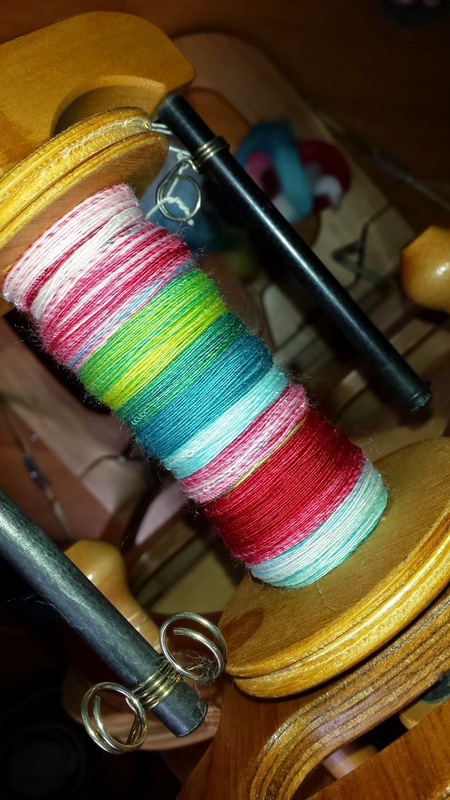 It’s easy to spin a fine singles with Superwash Merino blended with Nylon. Part of the reason for that is that it isn’t crazy slippery, nor is it sticky. It’s just perfect. The twist doesn’t run away on you and yet you can easily hang on to it long enough to give the amount of twist needed to give the chain ply character. I’m on holidays this week and the following two, so I am planning on getting this spun up in my spare time. 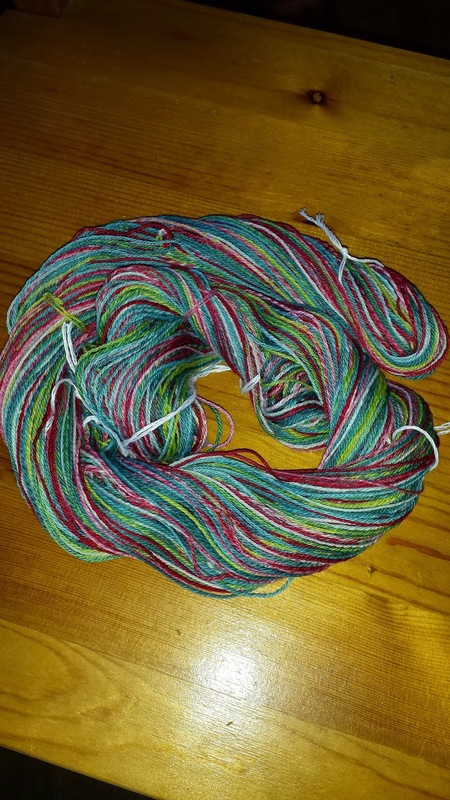 This entry was posted in fibre club, spinning, Sweet Georgia Yarns on July 24, 2014 by DianaTwiss. 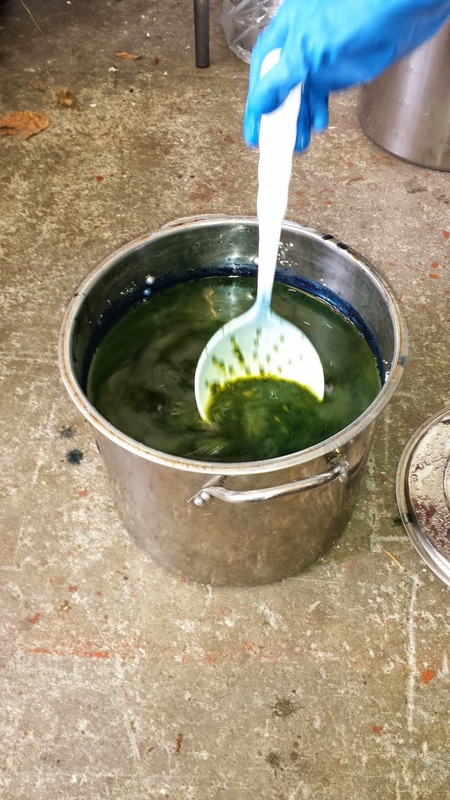 Last month I spent an entire Saturday at Ann’s place learning how to make indigo dye vats. Our guild (like many others) has a wonderful scholarship program. If you want to take a fibre arts workshop or class, you can apply to the scholarship fund and get a portion of your tuition covered by the guild. In exchange you are required to give back to the guild in some manner. 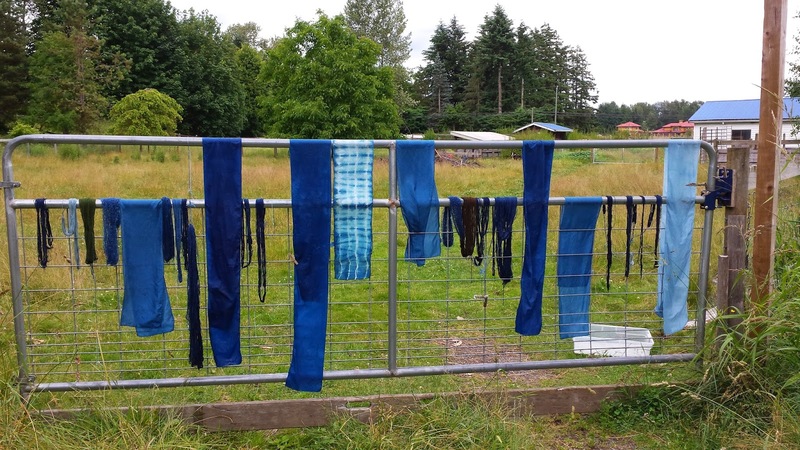 Ann attended a couple of workshops at Maiwa and her “pay-back” to the guild was to offer an indigo dyeing workshop – sharing some of the key things she learned. From the Maiwa website: Natural indigo is an extract prepared from cultivated plants of Indigofera Tinctoria. Indigo is the only source of blue in the plant world. Its ability to produce a wide range of blues has made it the most successful dye plant ever known. What you see below is a fruit vat. This one is made with bananas, but you could make it with mangoes instead. To make a litre of dye you take one very ripe banana, mash it up and add 1/4 c water. Keep mixing this and then add 1 TBS of indigo dye powder. Add a bit more water and then add 2TBS hydrated lime. Keep mixing and add enough water to make one litre. The pot you see below is 10 litres. . . . so it started with 10 mushy bananas. 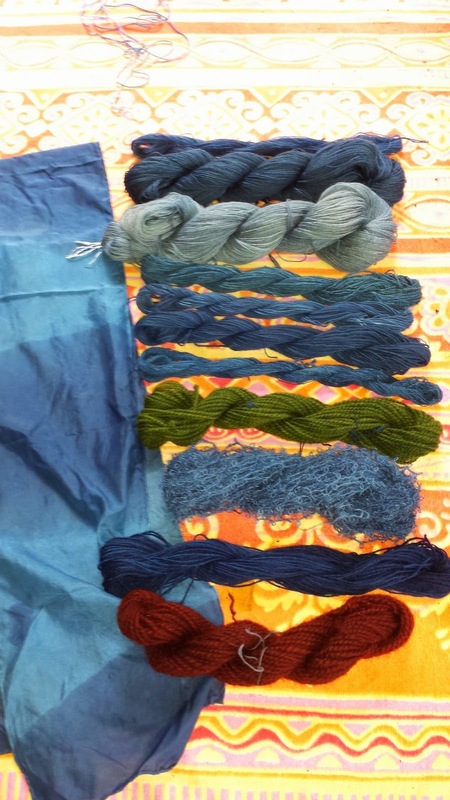 These are cotton and rayon samples dyed in the fruit vat. These are wool, silk and mohair samples that were dyed in another vat made with ferrous sulfate. 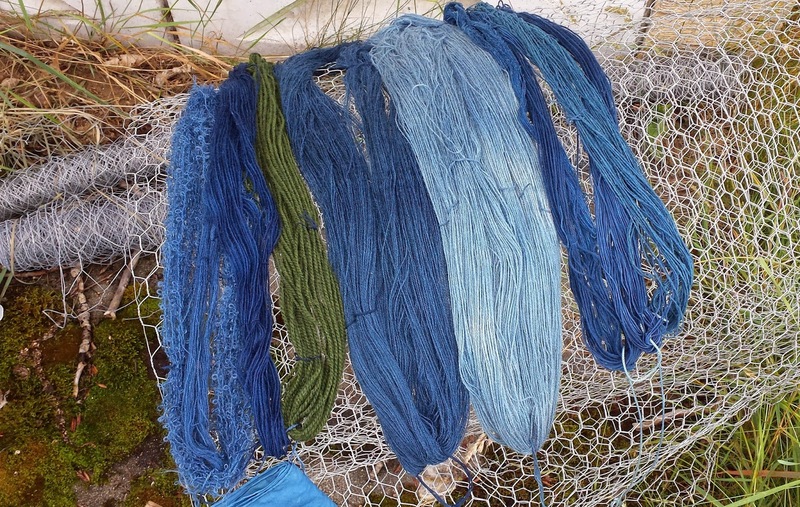 The green skein is an overdye from a skein dyed with turmeric. Then of course we had to play with silk and cotton scarves to see how quickly the dye sinks into those fibres. And nothing like a good gate to hang the skeins and scarves as they oxidize. And here is the total collection of samples I did. Each one had a couple of dippings as I tried to get more intense colour. They continue to oxidize and deepen in colour. I won’t even pretend to understand the chemistry of indigo, yet. It is something of a mystery, but hopefully not for long. Ann has graciously offered to put up more dye vats and we can continue to play and learn. 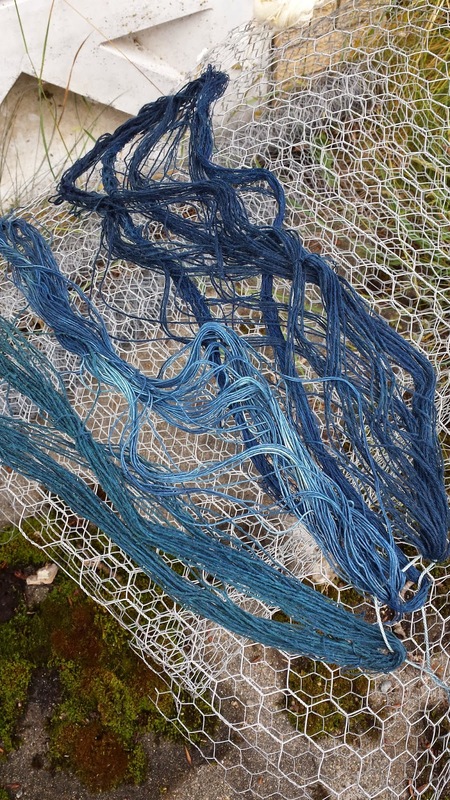 This entry was posted in dyeing, indigo on July 23, 2014 by DianaTwiss.